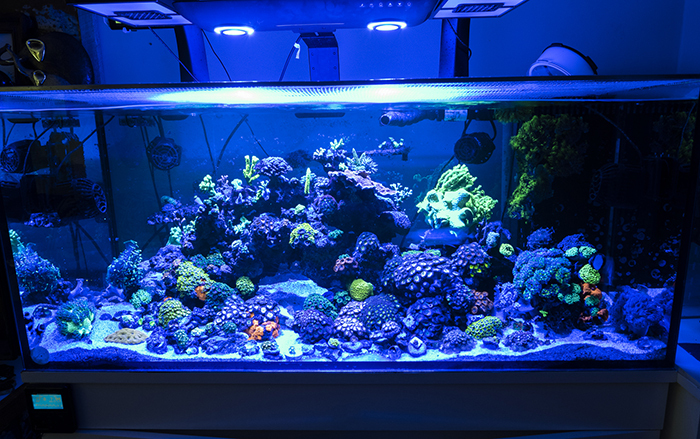 By Marcin Smok LED light emitters glittering over a reef tank’s water surface, providing life giving energy to the corals and other photosynthetic animals beneath, is as much of a typical sight nowadays as metal halides hanging over reef aquariums were in the nineties and early 2000s. 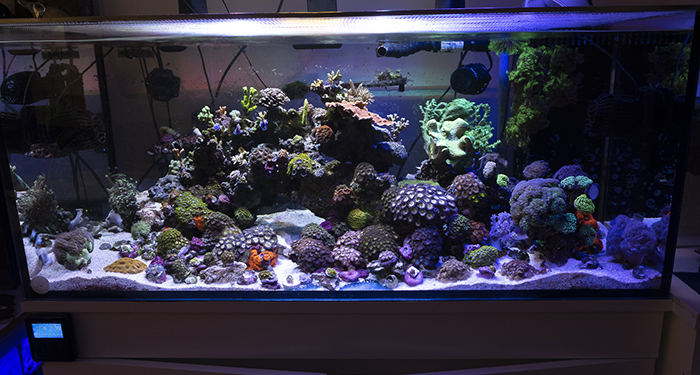 The debate over the ability of high power, light emitting diodes to grow coral is largely over, buried under the overwhelming photographic evidence of beautiful tanks lit exclusively by this source of artificial light. Today, almost everyone that has had experience with the technology, agree that indeed, they do grow coral and they do so efficiently. And so the debate has shifted to topics like light wave distribution throughout its spectrum, optimal PAR ratings, optics and light spread, color blending, etc. 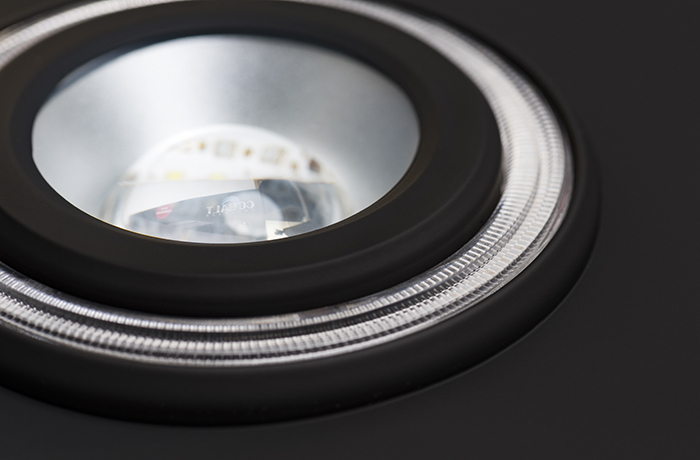 A premium light deserves premium packaging and Cobalt doesn’t disappoint. A slick, black box with pictures of the light and some basic information printed on each side of the packaging dominates the theme. When opened, a white plastic mold with a velvet-like coating protects the items that come with the light. 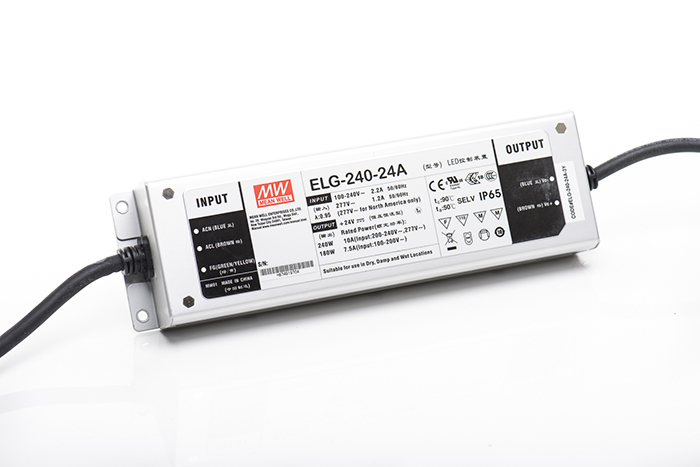 These are: an LED panel with a quick connect power cord, a waterproof LED driver/transformer made by Mean Well (model ELG-240-24A), and a steel cable hanging kit (complete with quick-adjust fittings and ceiling anchors). My first observation, upon lifting the LED panel out for examination, is that C-Ray 200 is SOLID. 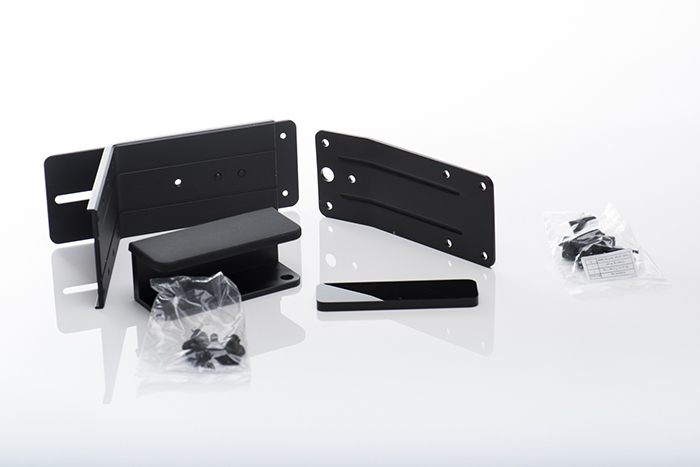 The top cover is made entirely of anodized aluminum, with flush mounted grill cutouts that serve as air intakes for the fans hidden inside the case, as well as four threaded holes for the included hanging kit. 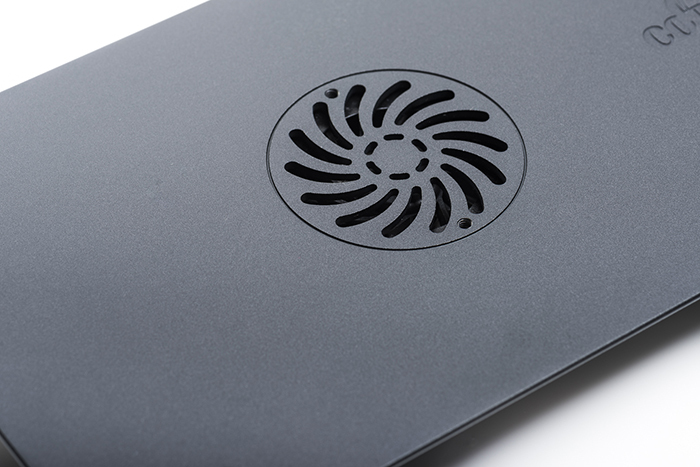 The bottom part is also aluminum, coated with a soft velvety finish that is just stunning to look at. It’s also a fingerprint magnet, but oh well, it’s that or the glossy black plastic other manufacturers use, both materials are aesthetically pleasing but painfully hard to clean. 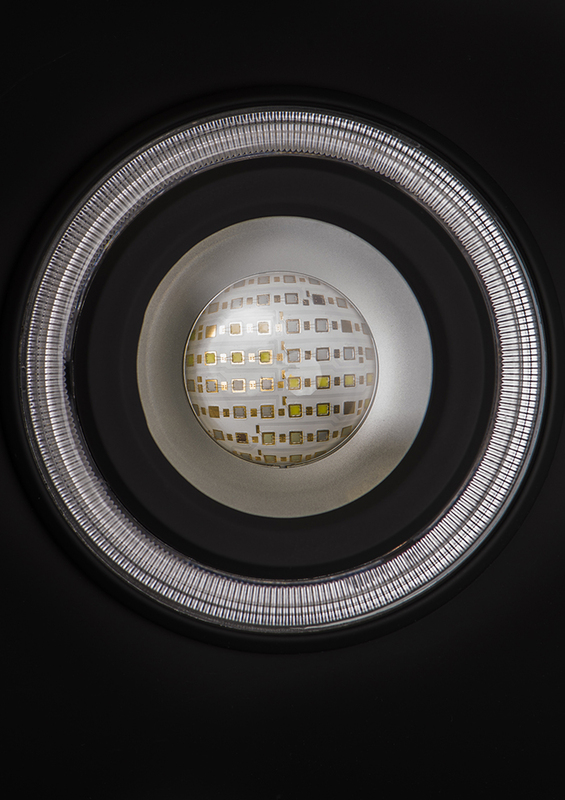 The two main LED chips, surrounded by the halo ring of emitters (more on that later), sit 12-½” apart (around 33cm, center to center); the overall length of the light is a little over 20” (51cm). The convex shaped lens mounted on the LED array is protected by an additional flat glass cover that’s dead simple to clean (yes, I tested that:)), plus it provides an additional level of splash protection to the light. 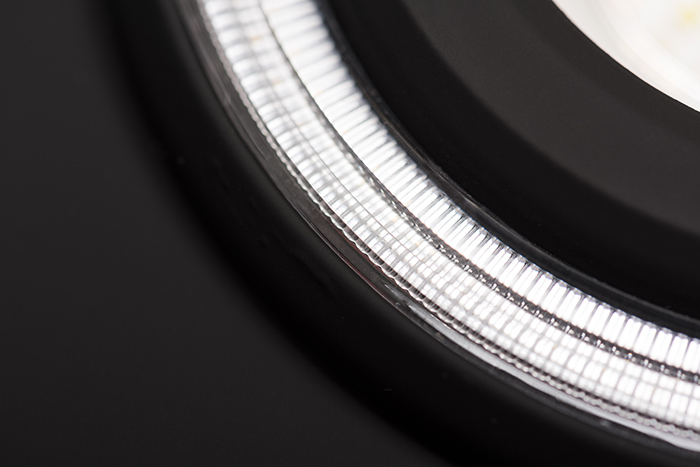 A centrally located, 5-½” long (14cm) fill striplight has its own light dispersing lens cover that blends with the frame seamlessly. I was so eager to see what was inside C-Ray 200, I had to fillet it (mostly likely voiding the warranty in the process). What I found confirmed my overall opinion on the light’s build quality. 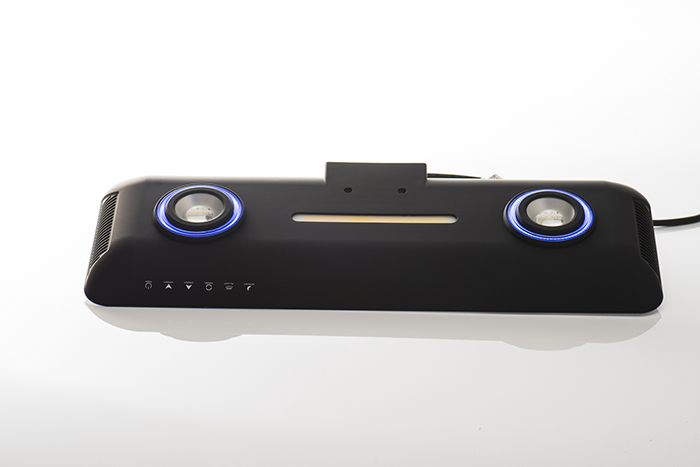 The electronic components are neatly and compactly arranged, with plenty of room for air circulation. 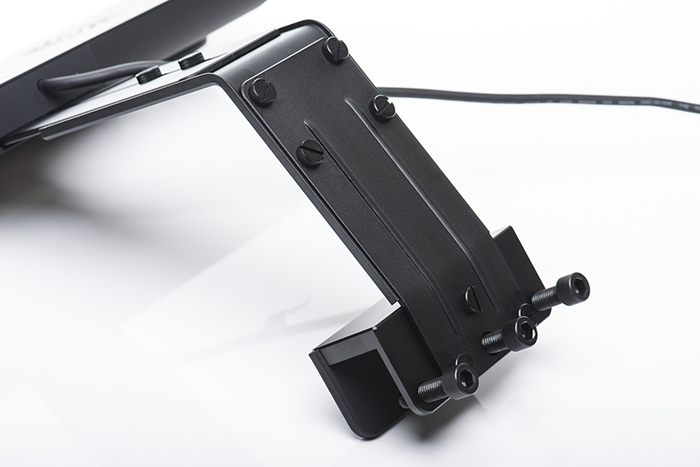 An oversized heat sink, paired with dedicated blower fan, is mounted on each side of the light. 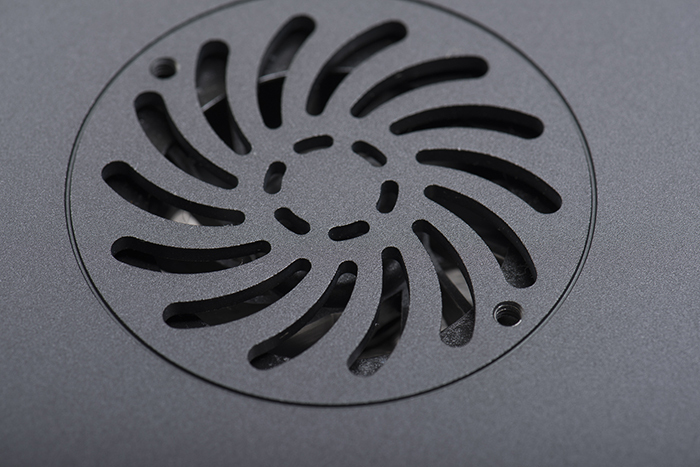 The fans are temperature controlled, meaning they turn on only if the LED chip heatsink reaches a certain threshold temperature. 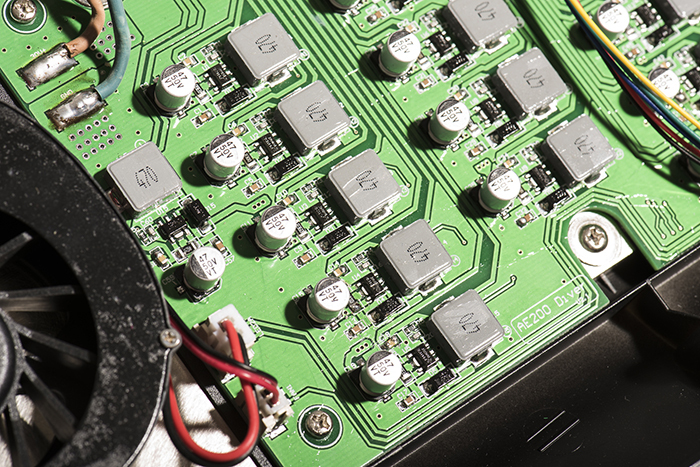 A close examination of the main board reveals the built in Wi-Fi module and antenna, as well as the dimming module that operates using the PWM protocol as opposed to a less sophisticated 0-10V signal. So far so good. 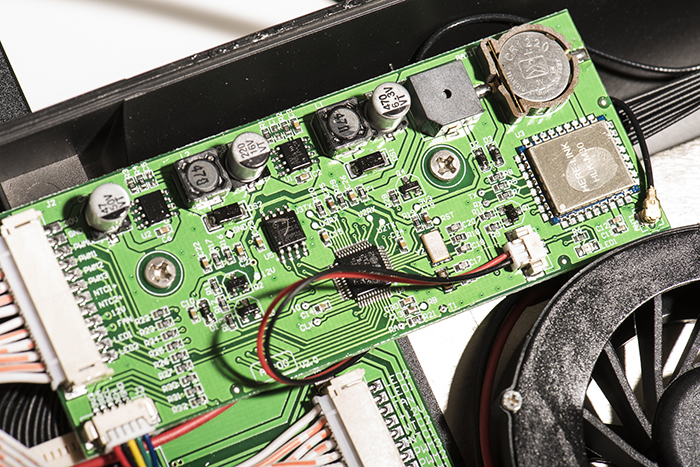 Putting Cobalt C-Ray 200 together is a straightforward operation and only requires a phillips screwdriver. 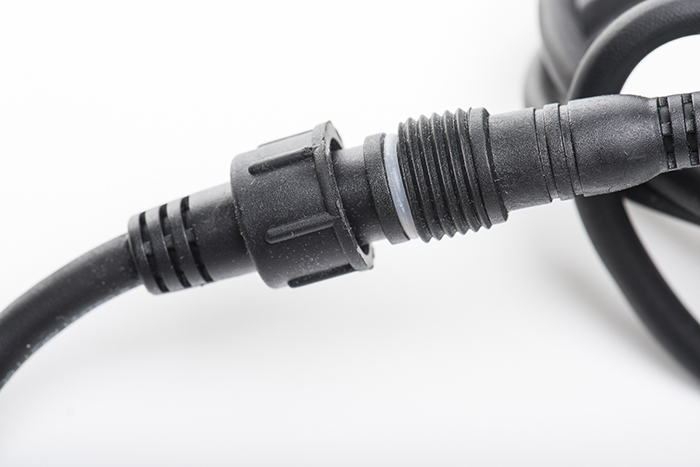 With the light secured to the tank’s rim and the driver plugged in, I dug into the online manual to see how to operate it locally. 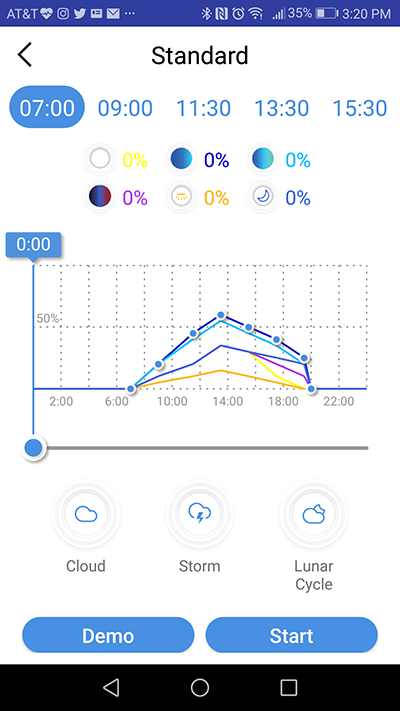 Although the vast majority of users will probably never touch the on-board buttons after initial setup, the light has a fair amount of controllability even if you don’t use the dedicated app. Let’s talk about that. 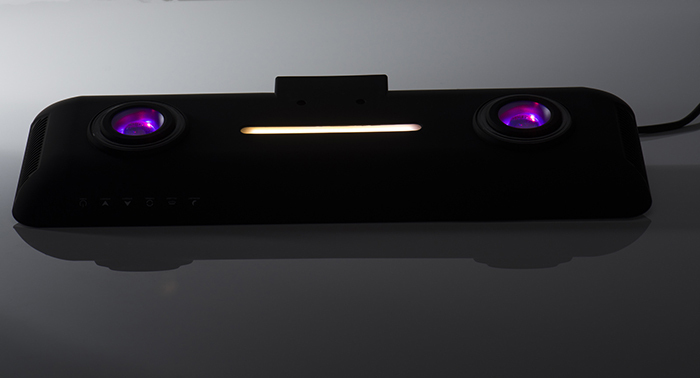 The 6 buttons, labeled from left to right, Power, Intensity (up), Intensity (Down), Channel, Fill Light, and Moonlight, are capacitive touch, which means that they are sensors on the inside of the case and completely integrated into the outside surface, much like controller panels in most modern kitchen appliances. I have to admit, I was never a fan of these types of buttons and prefer mechanical buttons, mainly because touch sensitive buttons tend to fail to register feedback from time to time. 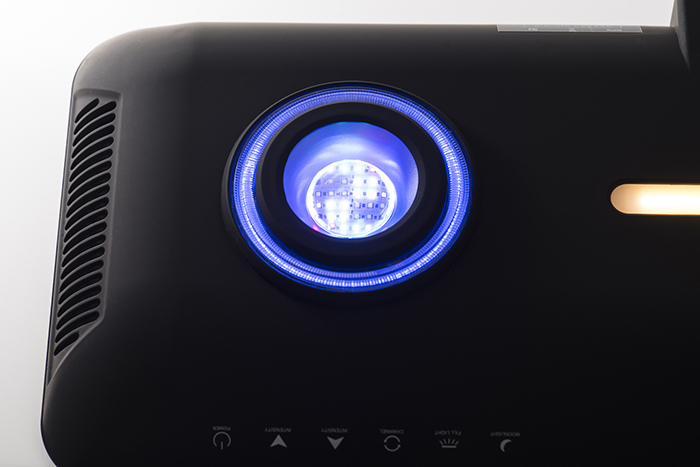 There was an aquarium light I reviewed a few years ago that featured capacitive touch buttons and I remember pulling my hair out after hitting the “ON/OFF” button numerous times just to turn it on. To my surprise, this is not the case here- C-Ray on board buttons work every time and all the time. I even performed the “salty hands” test, trying to change settings right after pulling my hand out of saltwater and the light had no problem registering my fingers. It’s quite cool actually to have this type of button on the light when they work… The first time you approach the light, all buttons are locked to prevent accidental presses. 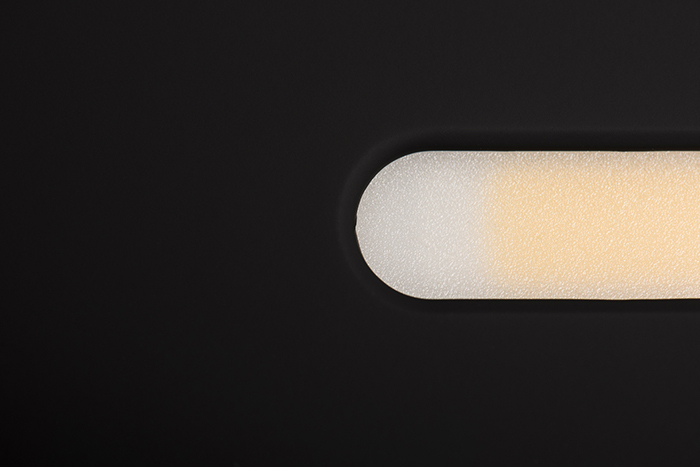 To unlock the light, you hold the Intensity Up and Down buttons for 2 seconds. The light gives out a “beep” sound, informing you it is ready to go. The “ON/OFF” button turns the light on/off (duh) and the Intensity buttons dim it in gradual increments. A combination of Channel button and Intensity buttons allows for dimming the Cree chip channels. 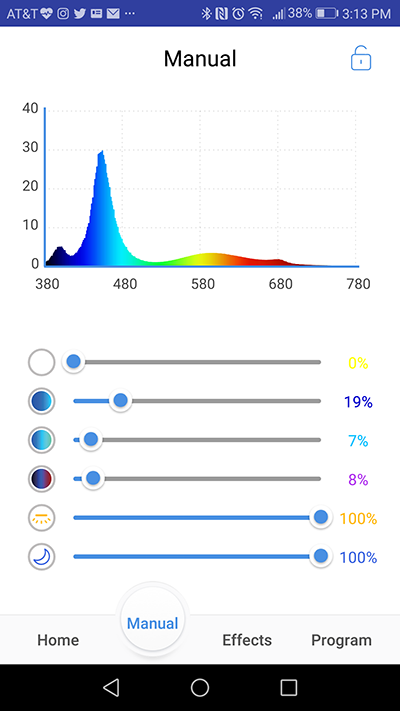 There are 4 of those- “Cool white”, “Blue”, “Royal Blue” and “Red” (Keep in mind the names of channels are only arbitrary, based on my previous experience with Cree emitters, they actually are unnamed in the Cobalt app) and each has 6 intensity settings. Moving on, the Fill Light button turns the middle warming bar on. Repeated presses shuffle through the fill light’s 4 dim settings. Finally, Moonlight turns the halo LED ring on/off and again, there are 4 dimming stages for that channel. 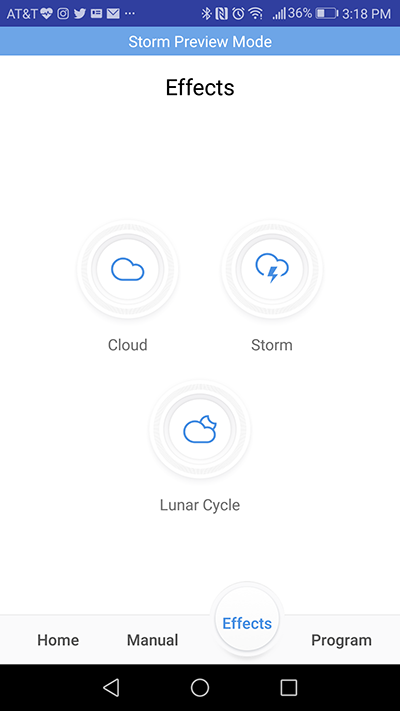 You can’t physically set photoperiod or trigger any of the built in effects, but again, who cares when there’s an app for that. In fact, Cobalt C-Ray 200 has more on-board controllability than most other high end lights on the market, not that it really matters in my opinion. The App When downloaded and installed, the free dedicated application called “Cobalt”, available in Google Play and Apple App stores, opens up a world of opportunities when it comes to controlling C-Ray 200. Frankly, if you are thinking of purchasing that light, or any app controlled high end light for that matter, and do not plan to use the remote control ability, don’t do it. I am gonna repeat myself here, but it’s like getting a Ford Mustang Shelby GT500 and putting a governor on it. 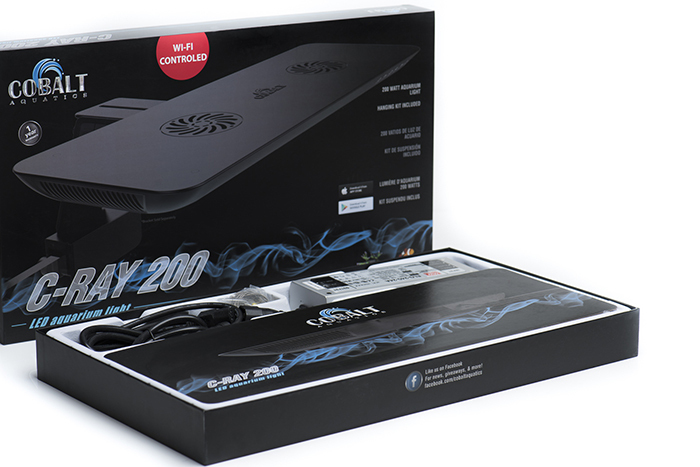 Cobalt C-Ray 200 is equipped with a Wi-Fi module that allows it to be controlled remotely. Just to clarify, it’s not an over-the-Internet controllable light, but rather a direct Wi-Fi connected device. It means that the light generates its own Wi-Fi hotspot, to which you can connect using your mobile device. I personally think that an aquarium light is something I “set and forget” and tweak it only if I feel the need for it, in which situation I stand in front of my tank to see the changes in real time. 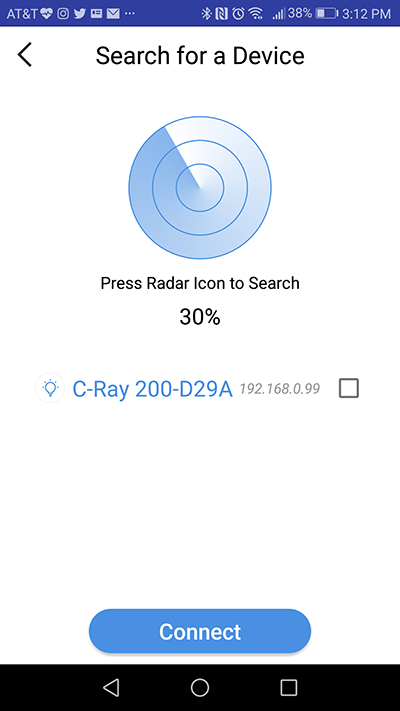 To unveil C-Ray 200’s full range of capabilities, you need to install the app (side note, I am reviewing the Android version of the app as my phone uses the Google operating system, but I’ve forced my non-reefer friend to install it on his Iphone and the interface between the two apps is almost identical). Upon opening it for the first time, a page from the manual comes up, explaining how to set up the Wi-Fi connection. That activates the Wi-Fi module and enables the phone (or other mobile device) to connect with the light. 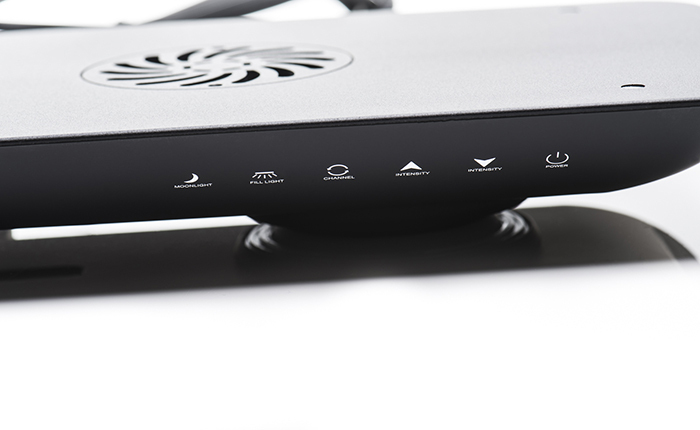 The Wi-Fi network of the light starts with AE200 and has a range matching that of a typical home router, meaning you can easily tweak the light from another room if you need to. Finally, the most important feature of any light in this price segment, the “program” tab gives a user the full advantage of the light’s capabilities. 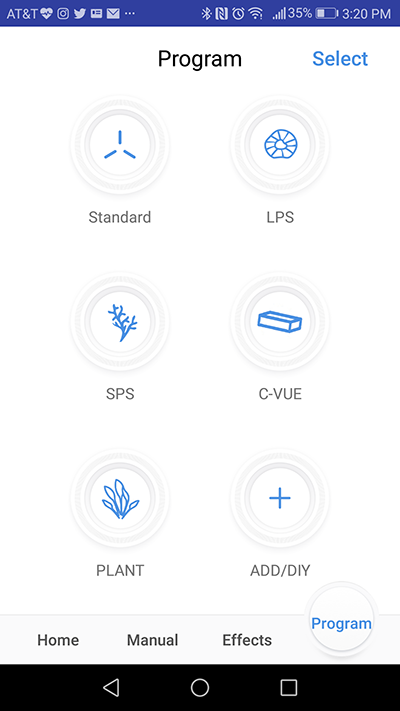 There are five presets built into the app, labeled “Standard” (for mixed reefs), “SPS” (for “sticks” dominated aquaria), “C-Vue” (designed to accompany Cobalt’s C-Vue line of tanks), “LPS”, and “Plant” (for planted tanks if you want to use C-Ray 200 for that purpose). Each of the five presets can be modified to your own liking, and you can save the tweaked schedule as a new preset.Alternatively, you can start from scratch and create your own DYI schedule. Adding new presets is very easy, simply press the “Add/DIY” button and name your new preset, after which the app takes you to the program screen. Again, the programming interface of C-Ray 200 is very organic and I didn’t really have to reach for the instructions to understand how to write a schedule for the light. The top part of the new program tab is occupied with the visual representation of the 6 dimming channels with their current intensity levels next to their icons, plus “Add” and a “Delete” timepoint buttons. There is also a “Download” button in the upper right corner if you wish to download preset data and save it on your device and/or share your schedule with others. Underneath the dimming channel icons is a time/intensity graph with a slider just below it and on the very bottom of the screen, the three “Effects” buttons I mentioned in the previous paragraph. 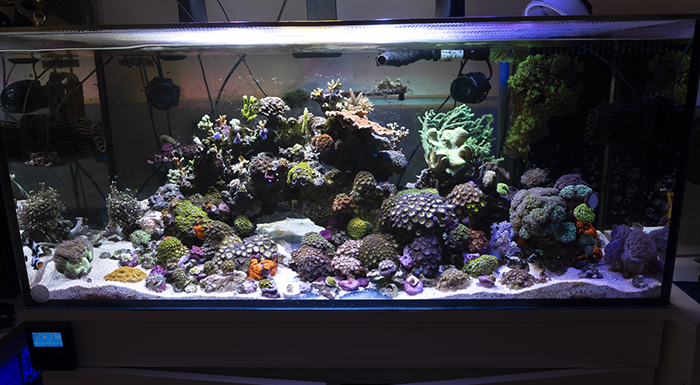 PAR values, the megapixels of the reef lighting industry. 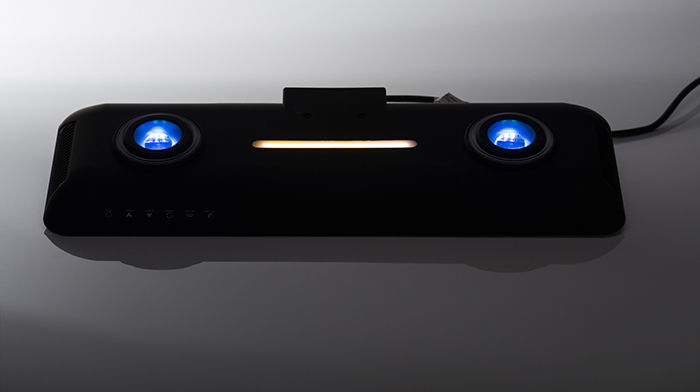 I wouldn’t be able to pull off this review without checking how much usable light C-Ray 200 outputs with its two LED arrays, combined with a fill light and a moonlight halo. After all, numbers may not decide the given light’s fate, but they do matter, especially in the top shelf segment. I upgraded my testing ground to a brand new rig, made of a photography boom stand setup to be parallel with the testing surface, on which the test light rests, a light absorbing black matte foam, and an apogee PAR sensor that’s a part of Neptune Systems PMK, mounted on a custom made bracket that positions the sensor perfectly perpendicular to the light source. The test foam, 36”x 48” in size, as scribed with a matrix of test points, provides a base for a surface chart made out of individual PAR measurements. All tests were performed out of water as this is how Apogee recommends using their original PAR sensor. PAR measurements taken in air read higher than those taken underwater, because of the so-called immersion effect, and therefore my result should be divided by 1.08 for an actual PAR reading you would expect when the sensor is immersed in salt water. 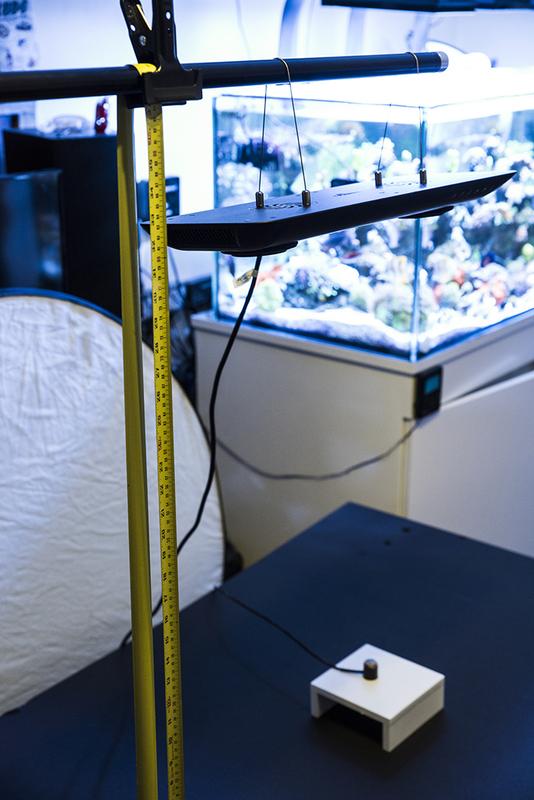 There are some other factors that make taking accurate PAR measurements underwater more difficult (such as water movement, sensor positioning in relation to the light source, etc) and so I decided a controlled, flat surface of my home studio would render more accurate test results. For further read on the topic of underwater PAR measurements, go to:“Underwater PAR Measurements” from Apogee Instruments website. The PAR test I performed for this review covers an area of 36” x 48”, measured at three different distances from the surface of main LEDs’ lens: 12”, 18”, 24” and 30”. Each PAR reading was repeated for accuracy and the median from the two readings is represented on the PAR chart:PAR readings @12” (30.5cm) from light source. 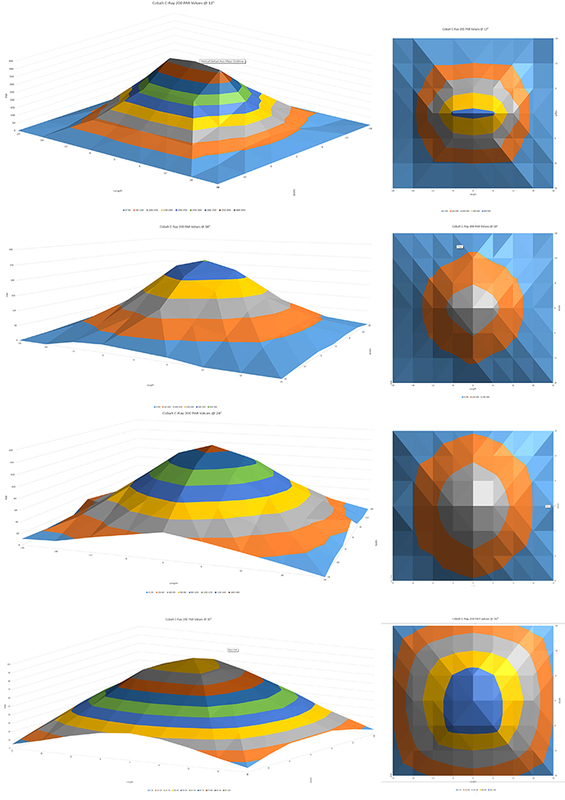 1) PAR readings @ 12” (30.5cm) from light source; 2) PAR readings @ 18” (46cm) from light source; 3) PAR readings @ 24” (61cm) from light source; 4) PAR readings @ 30” (76cm) from light source. Photos by Marcin Smok. Let’s analyze the data. At 12” from the light source, which in my opinion is the minimum LEDs should be tested for PAR, the light outputs a maximum of 432 µmol m-2 s-1 and maintained PAR above 400 in line with the light axis in a 12” distance. Looking at the overall PAR map, at 12” height, C-Ray-200 produces PAR between 150-430 in an area of 12”x24”. Moving on to 18” from the light source, the maximum PAR produced at dead center from the fixture averages at 254 and averages 200 in a 6” radius from the center. At 12” from the center of the light in each direction, PAR drops to around 100 and to 45-60 when you move the sensor to 18” from center. At 24” from the center in either direction, there is still detectable PAR, averaging around 20.PAR measurements at 24” from the light source yield a maximum PAR of 149, with an average PAR of 124. PAR drops to an average around 80 in the 12” radius and 40 in 36” radius.One final measurement, at a distance of 30″, tops at 99 in the center and averages 88 within 6” radius from the center. At 12” from center, we get PAR between 50-70 and at 18” from 35-51. Disclaimer: I don’t own an optical spectrometer. This shortcoming prevents me from giving you an accurate measurement of electromagnetic spectrum, therefore all my observations are purely visual. The light produced by Cobalt C-Ray 200 is very pleasing to the eye and it renders coral colors accurately, giving it the eye melting shimmer I’ve mentioned. 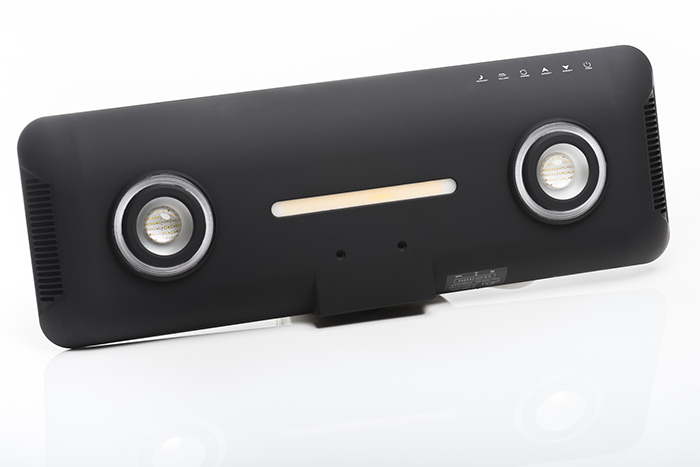 I’ve tested C-Ray 200 in the “SPS”, “LPS” and “Standard” modes and I liked them all. 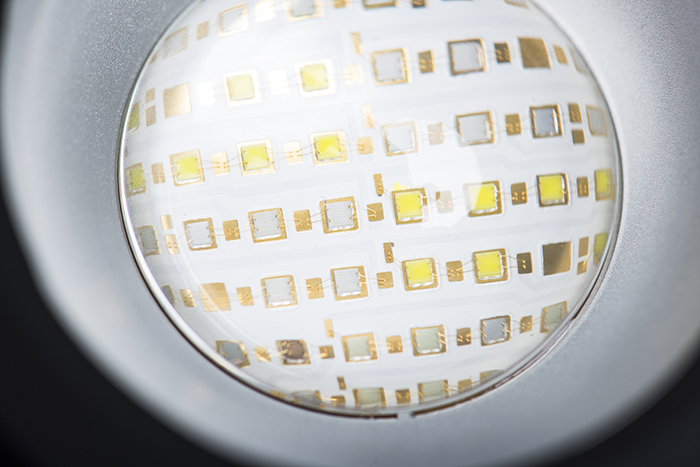 It produces bright, penetrating light that can definitely be considered “high end”. 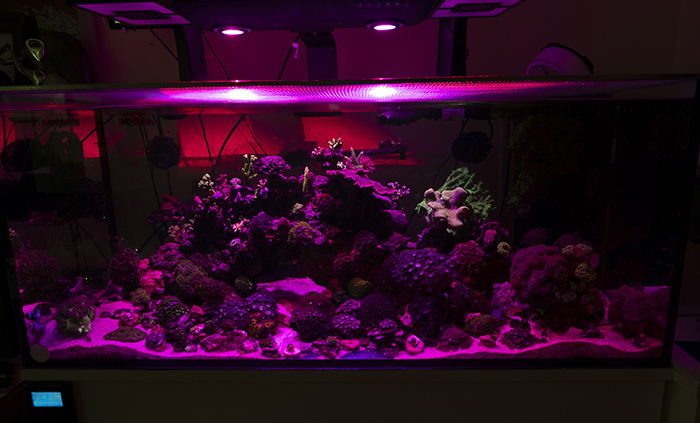 In terms of growing corals, I can say that it definitely does help them get their daily dose of photons, but I cannot ultimately judge if it’s better or worse than the previously mentioned light I use daily. Coral husbandry is a complicated, multi-layered topic and light is only a part of the equation, therefore judging coral growth based only on the type of light used is incorrect, in my opinion. 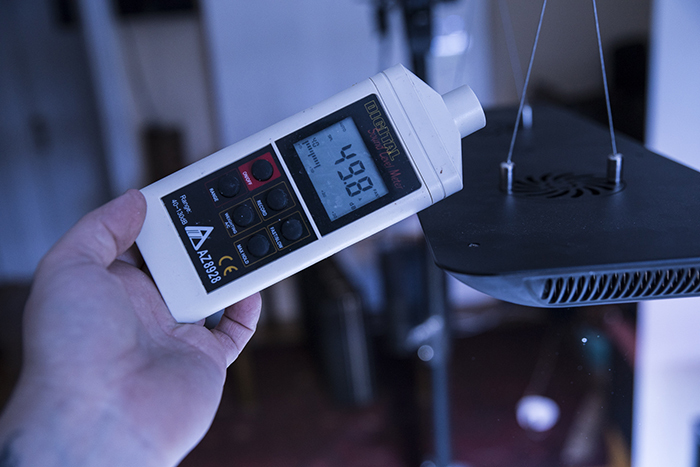 Like I stated before, C-Ray 200 is a serious contender in terms of PAR it produces, but it doesn’t give out the best numbers in the industry. Red channel only. Photo by Marcin Smok. Deep blue + halo light. Photo by Marcin Smok. “Standard” mode. Photo by Marcin Smok. LPS mode. Photo by Marcin Smok. SPS mode, 40% intensity. Photo by Marcin Smok. Instead, I do want to talk a little about the two features built into Cobalt C-Ray 200- the halo light and the fill light. 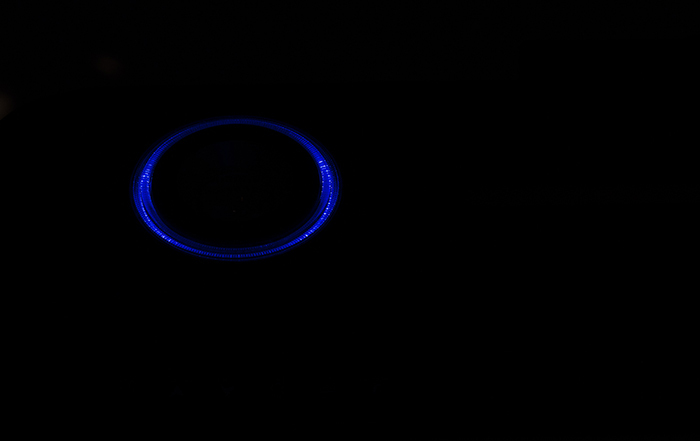 The circle shaped array of LEDs, mostly likely SMD style, that surrounds the main puck, is composed of deep blue emitters that produce some impressive moonlight effect in the tank. When I say impressive, I mean pleasing to the eye, subtle and quite dim. If you’re looking for a light that “squeezes” fluorescence out of corals, C-Ray’s 200 halo moonlight alone does not deliver (it does, though, when combined with the deep blue channel from the light’s main LED array), instead it produced that cool afterlight I usually set for the morning hours to enjoy my aquarium with a cup of coffee in hand before I leave for work. To me, it’s one of the highlights of C-Ray 200. Not that it cannot be reproduced with other lights, it’s just that Cobalt’s light has a separate channel just for that, which is very cool. I ended up writing these final words with mixed feelings. One one hand, Cobalt C-Ray 200 grew on me. I didn’t have high hopes when I first read about the light, but when I actually got a physical light for this review, it surprised me with its solid build, high end LED chips and optics, a sleek, uniform design and good quality, waterproof driver. 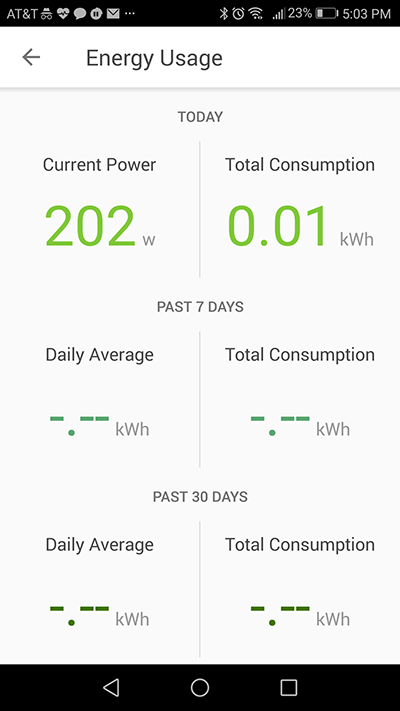 On top of all that, my experience with the mobile app and light connectivity was nothing short of spectacular- my phone connects with the light’s Wi-Fi instantly plus the effects of changes made to the schedule are translated to the LEDs in an almost live fashion. But then, there’s an elephant in the room and it’s C-Ray 200’s price tag. At a suggested retail price of $799 (plus another $99 if you opt for the tank rim arm), it doesn’t come cheap by any stretch of imagination. 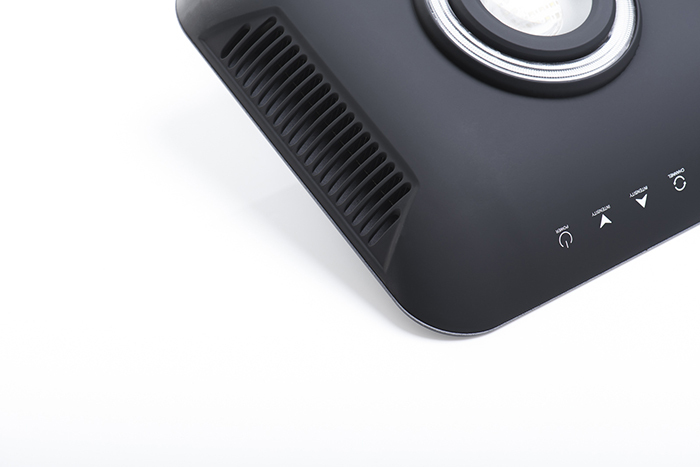 Being in the same price category as the Ecotech Radion XR30w G4 Pro, Kessil AP700 or the Maxspect 24” Recurve LED, it faces tough competition from well established players. It’s not a flawed light, by any means, plus it offers some unique features people may enjoy, such as halo moonlights, the beautiful shimmer, and the fill bar, but it suffers from unequal PAR distribution, a characteristic all multi-chip LED clusters share from what I have learned so far. The fill light and the good quality lens helps a little with the shadowing in between the two main LED pucks, however areas of high PAR levels at all distances I’ve tested are narrower than comparable multi-chip lights I’ve reviewed in the past. That being said, C-Ray 200 can certainly grow corals and render their colors in its own, unique way. My final word is this: C-Ray 200 debuts with a solid product in the highly competitive market of reef oriented LED lighting, I just wish it was a little cheaper to attract more early adopters. I might be wrong though and Cobalt may see the light flying off the shelves despite its bold pricing. If that proves to be true, good for them. 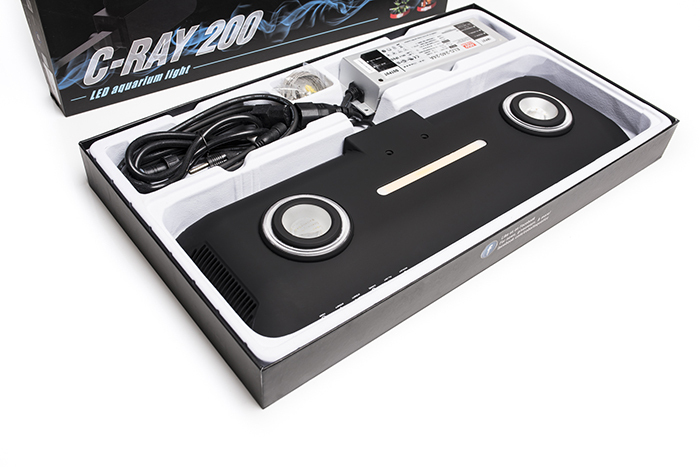 Cobalt C-Ray 200 comes with a 1-year limited warranty and is currently available online and in stores. Thanks for the read and come back soon for another Definitive review, of Cobalt’s new C-Vue all in one aquarium line.